Unilateral anesthesia is an uncommon complication of epidural anesthesia and is due to an uneven distribution of local anesthetic. We are reporting a case who developed persistent unilateral epidural anesthesia. Computed tomography (CT) epidurography revealed a barrier in posterolateral space leading to unilateral spread of contrast media. A 25-year-old male patient weighing 65 kg and 165 cm tall was scheduled to undergo dynamic hip screw surgery for subtrochanteric fracture of the right femur. The patient was apparently well with no significant problem in clinical history, examination, or laboratory investigations. There was no previous history of meningitis or central neuraxial blockade. Epidural anesthesia was planned and in sitting position, epidural space was localized in midline at L4-5 space with 18 G Tuohy needle using loss of resistance to saline technique. An epidural catheter with multiple side holes (Epicath, Romsons India) was inserted without difficulty leaving 3 cm in the epidural space. A 20 ml of 0.75% Ropivacaine was administered and patient was turned supine. After 15 min, the sensory level reached to T8 level with profound motor block on right side with no detectable sensory and motor block on left side, even after 30 min. As the patient had adequate surgical anesthesia on operative side, the surgery was allowed to commence. Surgical duration of 90 min was uneventful and patient was hemodynamically stable. The patient received two doses of 10 ml 0.125% bupivacaine with fentanyl for postoperative analgesia and each time analgesia to pin prick and cold was on right side only. To clarify the cause of unilateral block, we obtained consent from the patient for radiological investigation. On 2 nd day, informed consent was obtained from the patient and CT epidurography was performed. A 5 ml of contrast (Iohexol 300, Unique Pharmaceutical laboratory India) diluted with 5 ml of saline was injected through epidural catheter and contiguous axial sections (100 Ma, 120 kV, scan time = 2 s, and slice thickness = 5 mm) were obtained from L1 to sacral vertebral bodies. Both early and delayed scans (after 15 min) were taken to see the spread of contrast media. Contrast media was seen from L1 to sacral level, but bulk of the contrast was in right posterolateral epidural space. A linear filling defect was seen at L4, L5, and sacral level. Segmental sparing of epidural block is not uncommon, probably due to anatomic variations of epidural canal; but strictly unilateral block is relatively uncommon. The proposed etiological factors for unilateral block are slow injection of small volume of local anesthetic, acquired midline adhesion,  misplacement of epidural catheter tip in anterior/anterolateral space or paravertebral space, ,, and presence of dorsomedian septum. ,, In our patient first two causes were unlikely, as sufficiently large volume of local anesthetic was injected and the patient had no previous history of central neuraxial block or meningitis which could lead to adhesions. Possibility of misplacement of catheter tip in paravertebral space was also unlikely as only 3 cm of epidural catheter was in the space; therefore local transforaminal escape was unlikely. This possibility was eliminated radiologically too. The most probable cause of unilateral block in the patient described was unilateral distribution of local anesthetic to right side only. The diffusion of drug to contralateral side was probably restricted by presence of a barrier in the left posterolateral space. 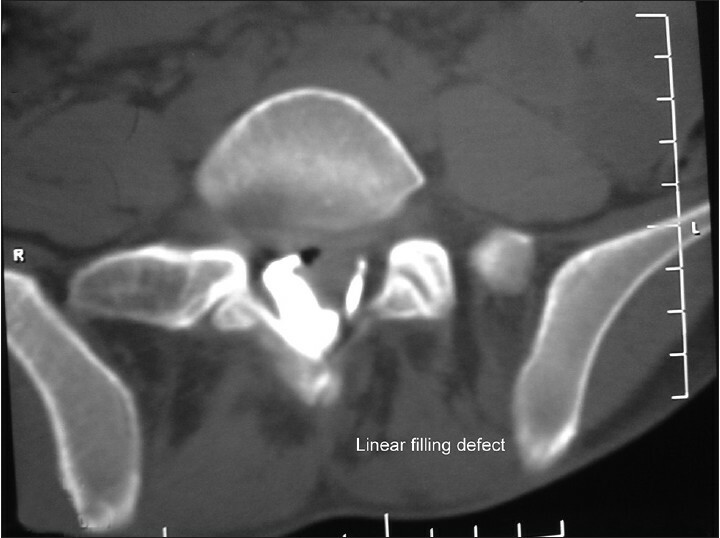 This barrier was evidenced in CT epidurography as a linear filling defect [Figure 1]. This could either be due to a dural fold,  epidural fat pedicle,  or a fibrous band. All of these can act as a potential diffusion barrier for circumferential spread of a solution in epidural space. ,,, Although a small volume of local anesthetic might have dispersed to left side also, the dose was too small to produce any detectable block. The other possible cause of unilateral block could be misplacement of catheter in anterior/anterolateral space. This has been cited to be most common cause of unilateral block. , But the lack of radiopacity of epidural catheter did not allow us to define the exact position of the tip in the epidural space. There are many case reports of unilateral anesthesia with CT epidurographic confirmation of the cause. ,,, Unlike these reports, the septum in our patient was in lateral epidural space. Usually presence of posterior midline septas are seen as a cause of unilateral epidural anesthesia but in our case, it was posterolateral, which presented as a filling defect. 1. Yamagami H, Yuda Y, Shiotani M, Ooseto K, Naganuma Y, Karasawa H. The administration of continuous epidural block under prone position with fluoroscopic guidance. Masui 1989;38:229-35. 2. Usubiaga JE, dos Reis A Jr, Usubiaga LE. Epidural misplacement of catheters and mechanisms of unilateral blockade. Anesthesiology 1970;32:158-61. 3. Asato F, Goto F. Radiographic findings of unilateral epidural block. Anesth Analg 1996;83:519-22. 4. Hogan Q. Epidural catheter tip position and distribution of injectate evaluation by computed tomography. Anesthesiology 1999;90:964-70. 5. Boezaart AP. Computerized axial tomo-epidurographic and radiographic documentation of unilateral epidural analgesia. Can J Anesth 1989;36:697-700. 6. Fukushige T, Kano T, Sano T. Radiographic investigation of unilateral epidural block after single injection. Anesthesiology 1997;87:1574-5. 7. Gallart L, Blanco D, Samso E, Vidale F. Clinical and radiologic evidence of the epidural plica mediana dorsalis. Anesth Analg 1990;71:698-701. 8. Harrison GR. Topographical anatomy of the lumbar epidural region: An in vivo study using computerized axial tomography. Br J Anaesth 1999;83:229-34. 9. Seeling W, Tomczak R, Merk J, Mrakovciæ N. CT-Epidurographie. A comparison of conventional and CT-epidurography with contrast medium injection through a thoracic peridural catheters. Anaesthetist 1995;44:24-36.